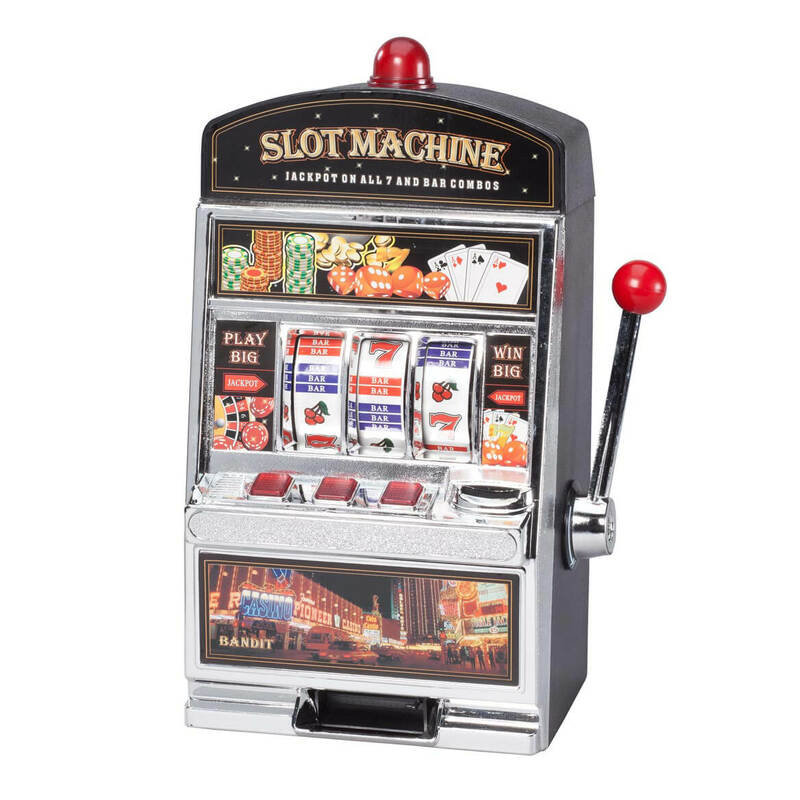 I just order the slot machine and waiting for delivery. I'm looking forward to having joyful playing time with it and also sharing it with my family and friends. The review I wrote for the small machine is doubled in pleasure and fun for the larger machine, especially with jackpot payout. The smaller machine is a fun item, but the larger machine doubles the fun when the payout light engages. Worth every penny, without a large investment. Handle isn't very sturdy and you must hold it at the bottom so it won't break. As long as you are delicate with the handle it works well. Adds fun to the game room. 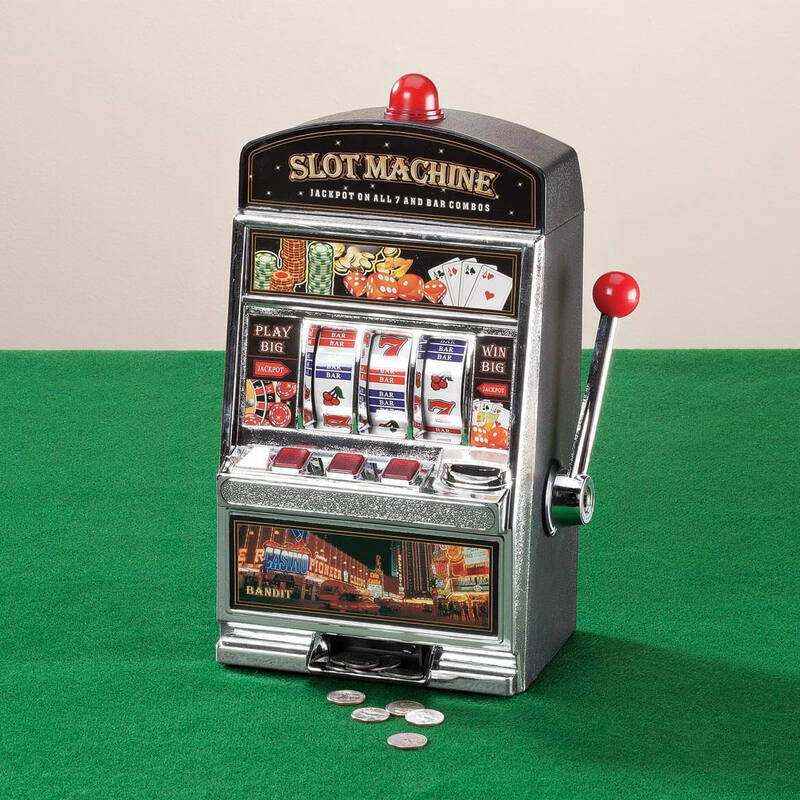 Jackpots pay out ALL monies in the bank put in through front coin slot and use of the lever. Monies not paid out are those you put in the upper left back coin slot. Lever seems fragile and jerks a bit. This is okay if you're a kid! This is a child's toy. Disappointing to an adult. Received this item cracked on the front. I tried it to see if it at least worked and it doesn't. It randomly pays out all the coins. Worst part is I have to pay the return shipping for a broken item. Do not waste your money. Terrible service! Looks like a fun way to save money or win a pretend jackpot! Love the little slot machines. Make fun gifts. I GOT IT FOR MY FRIENDS' BIRTHDAY, SHE LOVES TO PLAY. Wanna start a casino night with friends hoping this will be fun!! Looks like fun and reminds me of my trip to Vegas. Fun way to save coins. For an elderly woman that loves slot machines! I had one as a kid, and when I saw this one in a larger size, I knew I had to have it ! My child will love that real money comes out. I ordered this because I have the small one and love playing with it. I get to have fun and save my money; I don't have to leave home to do that. My children used to play with the one their grandparents had so I want my grandchildren to have one to. My mother in law is 85 yrs young and loves the slots...gives her somewhere to put her change when she visits AZ. 93 year old friend in a nursing home misses "gambling" Thought this might bring a smile to her face since she can't get put and gamble any more! We ordered one from another company, but it stopped working and we returned it because it was defective. Banks for grandkids who love to play with our slot machine. Grandson wanted one. Used someone else's and enjoyed it. Looked like fun & a good way to save coins! my children enjoy playing penny slots at nearby casino. With this I will fill it up with nickels and dimes. WHAT IS THE WEIGHT OF THIS ITEM AND WHAT IS IT MADE OF? BEST ANSWER: Thank you for your question. It weighs approximately 3 pounds and is made of plastic. We hope this information will be of help to you. Can you win and get a pay out? BEST ANSWER: Thank you for your question. There is a coin slot on the top left of the game to insert. They coins will drop when won, or if the machine is to full it will drop to clear room for more. We hope this information will be of help to you. What Tyler of coin does it take? BEST ANSWER: Thank you for your question. It takes 98% of world coins. We hope this information will be of help to you. REMOVING BACK DOOR DOES NOT "RELEASE" BANKED COINS. ARE YOU SUPPOSE TO HAVE TO "SHAKE" THEM OUT. YOU CAN'T EVEN SEE THAT THEY ARE IN THERE. HANDLE DOES NOT MOVE SMOOTHLY. SORT OF GRINDS. WHEN JIGGLING THE COINS OUT OF THE BACK OPENING A SMALL PIECE OF SILVER COLORED PLASTIC IN A V SHAPE FELL OUT. STILL WORKS OK BUT IS IT SUPPOSE TO BE A GRINDING PULL OF THE LEVER AND NOT BEING ABLE TO SEE THE COINS IN THE BACK OPENING TO CLEAR THEM OUT?